Klay Thompson scored a career-high 60 points in three quarters as the Warriors beat the Pacers 142-106. On a Golden State team loaded with scoring talent, Klay Thompson now has bragging rights. Thompson scored a career-high 60 points in the Warriors’ 142-106 blowout victory over the Pacers at Oracle Arena on Monday, eclipsing his previous high of 52 points against the Kings on Jan. 23, 2015. Although Kevin Durant and Stephen Curry have combined to win five scoring titles, neither Warriors star has registered a 60-point game. Indeed, Thompson joins Knicks forward Carmelo Anthony and Cavaliers forward LeBron James as the only active players to score 60 in a game. By scoring 60 points, Thompson set a new 2016-17 season-high, eclipsing Thunder guard Russell Westbrook, who netted 51 points in an Oct. 28, 2016, win over the Suns. He also becomes the first player to score 60 points since Lakers guard Kobe Bryant hit the mark exactly against the Jazz on the final night of the 2015-16 season. “I felt great, obviously,” Thompson told NBA TV during a post-game interview. “It was fun. I was in a great rhythm. I took all good shots, for the most part. Still missed a few wide open threes I wish I could get back. It was a fun night, to say the least. Thompson shot 21-33 from the field, 8-14 on three-pointers and 10-11 from the free-throw line. His outburst included 40 points in the first half, with 23 coming in the second quarter. 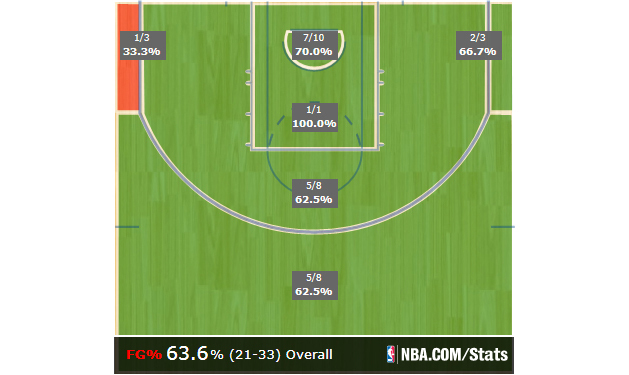 His shot chart, predictably, looked like a flowing meadow. Remarkably, Thompson tallied his 60 points in just 29 minutes, with coach Steve Kerr pulling him from the game with 1:22 remaining in the third quarter. No other player during the last 50 NBA seasons has scored 60 points in fewer than 30 minutes. Golden State improved to 18-3 with the win. Indiana fell to 10-11.